Upper Left: Overview of Trip Hikes. Upper Right: View of Passo Gardena, left Sella Group, Right Langkofel Group (Hike 1). Lower Left: Afternoon sun and light tricks on Piz dles Cunturines (Hike 2). Lower Right: Sella Towers and Passo Sella (Hike 4.5). The last big hiking-related trip here was in June 2008 at the beginning of the hiking season. This time around we are hiking in September, the tail of the hiking season. The trade-off between the two is that in September 2018 we had generally warm and sunny weather but much fewer flowers to see while in June 2008, we had stormy and gray days but with an incredible display of flowers. Another consideration in choosing your hiking time is when lifts and rifugi are open if you are depending on them. The Alta Badia site, Season and opening times of the Summer lifts, details the start and stop dates of lifts. In the first half of June 2008 when we first hiked around Val Badia, we didn’t find any lifts or rifugi open as we were just a few weeks too early in the hiking season. Do you need the lifts and rifugi to be open to enjoy hiking here? No, not really. But we’d say for beginner and average hikers, it’s better to have the lifts and rifugi, because it will get more out of your hiking day. For example, this trip (September 2018), we took the lifts to cut some boring bits of our hikes and we didn’t have to worry about carrying lunch because rifugi were open for snacks and lunch. We were in Val Badia for 6 nights and 5 full days for this trip. We were able to get in 4 full hiking days (with good weather) for a total of 43 km (26.7 mi). On our day off from hiking, we visited Bruneck (Brunico in Italian) and the nearby Kronplatz, Plan de Corones, specifically to see the MMM Messner Museum designed by Zaha Hadid. 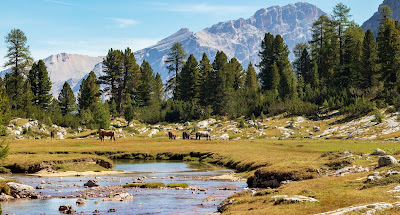 Left: Horses on Kronplataz (Pian de Corones). Center: MMM Corones - Museum of Zaha Hadid. Right: View north toward Gais from park around MMM Ripa. 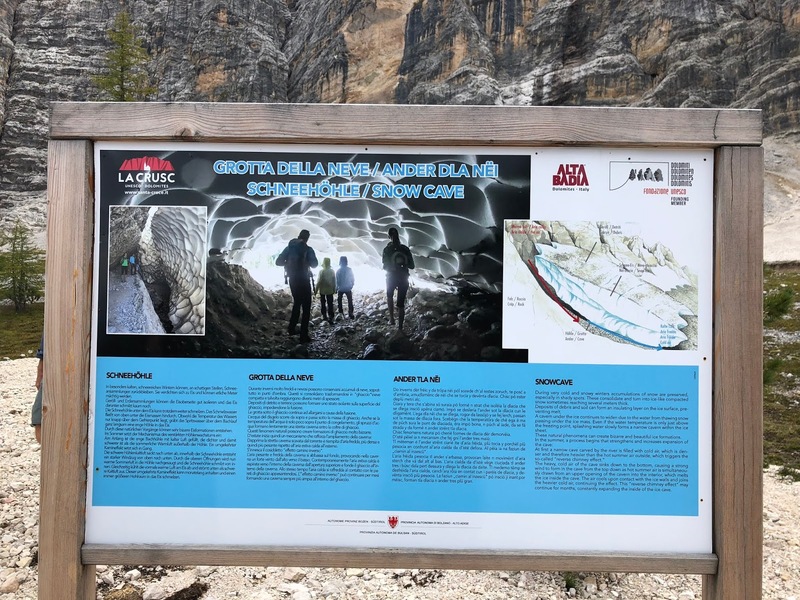 A good resource to use for this area is the Alta Badia app and the associated web site Outdoor Active. Hikes 1, 2, and 3 detailed below are specific recommendations from the app. 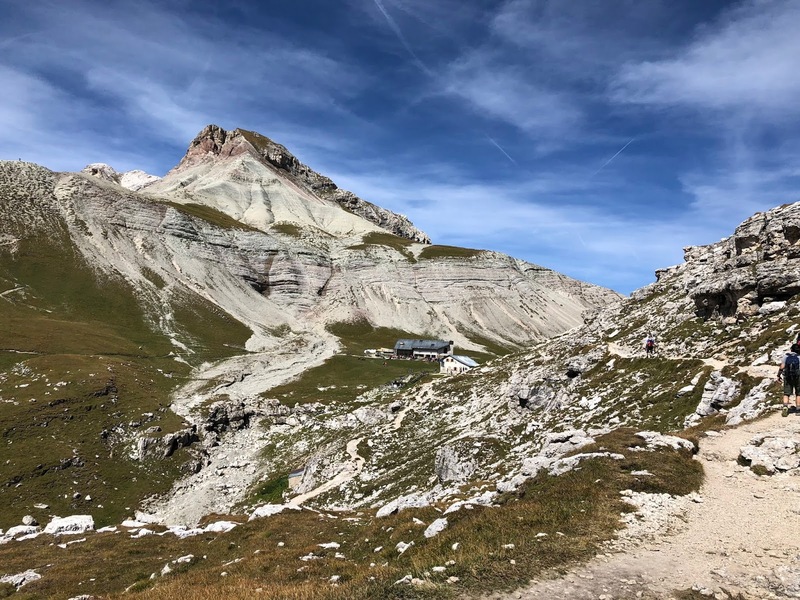 The fourth hike to Sass Pordoi is a popular and commonly recommended one. As you can tell by the times below, we walked at a very leisurely pace. We often stopped and sat to just enjoy the views. On all four hikes, lunch was at least one hour at a rifugio. 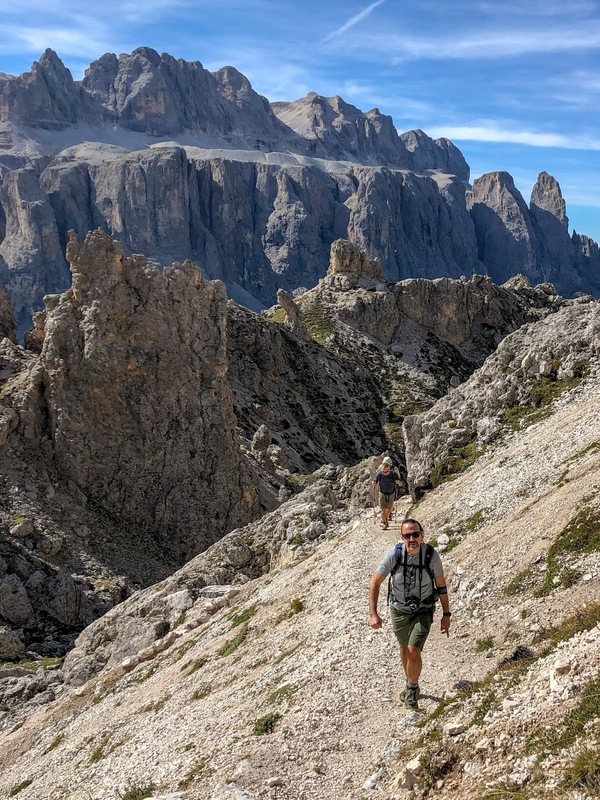 Clarification: Technically our hikes fall into three valleys: Val Badia, Val di Fassa, and Val Gardena. We use Val Badia in the post title because we our hotel is there and most of our meals were there. Duration: 4.5 hours walking time reported by Alta Badia app; we took about 8 hours including lunch and walking back to hotel Nature Hotel where we were based. Wow is all we can say. When we tried this hike 10 years ago in 2008, it was a cold and rainy day, and we walked away with mixed feelings about this hike. 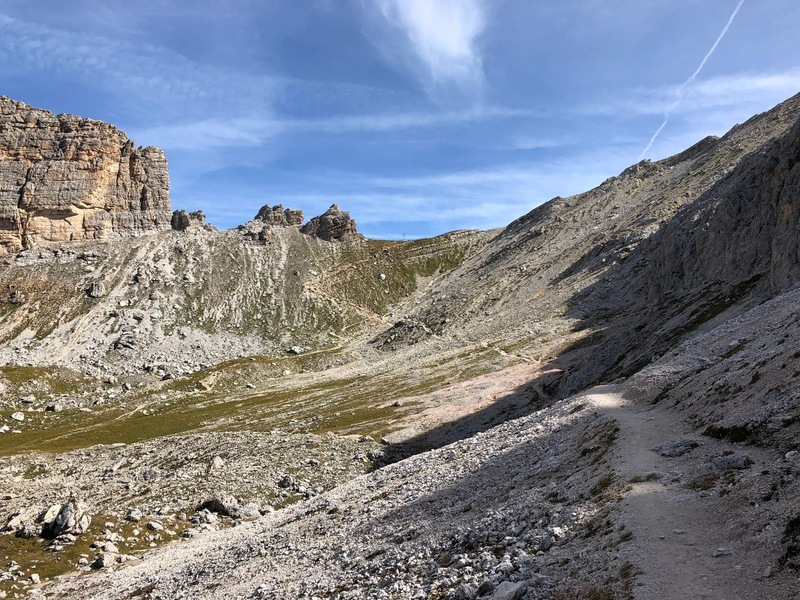 On this beautiful sunny September day in 2018, it was like a whole different hike, and we can see why at visit to Rifugio Puez is must if you are visiting the area. Aside: One of our rules of thumb for travelling is that, if we can, we try something – eating at a cafe, sitting in a piazza, visiting a church, or taking a hike – more than once to see what it’s like at different times. This is especially important if our first impression is negative. It’s a challenge to change our point of view. While it isn’t always possible to do repeat visits, we use this guidance when planning our trips. Staying in a place for just one night is something we strongly dislike and avoid if we can. Staying more than one night allows us repeat interactions with people and places from which understanding can grow. 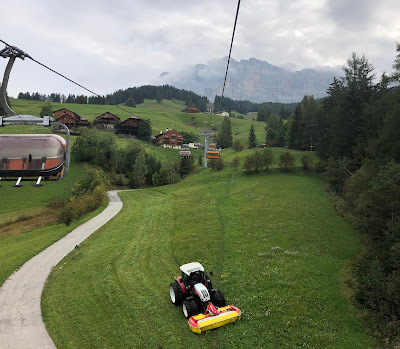 Since we were staying in at Hotel Nature Garni Delta, we decided to walk 15 minutes from the hotel to the base of the Plans-Frara gondola and take that to the trail head #2. We figured we saved about 2 hours and energy not hiking to Jimmy Hutte first. You can also arrive to Passo Gardena (just below Jimmy Hutte) by bus if you needed to. Top Row. Left: Hike 1 - A half hour from Jim Hutte, the Pizes de Cir. Center: Hike 1 - Heading to Passo Crespeina (2531 m). Right: Leaving Rifugio Puez, kooking southwest down Langental (Vallunga); in the distance Massiccio dello Sciliar. Bottom Row. Left: Horse stare-down above Colfosco. Center: Lech de Crespëina heading to Rifugio Puez. Right: Rifugio Puez. Jimmy Hutte or Rifugio Jimmy sits on the southern edge of the Parco naturale Puez-Odle, and is a common entry point into the park. We remember back in June 2008 sitting on the deck of a very closed Rifugio Jimmy – we were too early in the season – drinking wine from plastic water bottles and eating our squashed sandwiches. 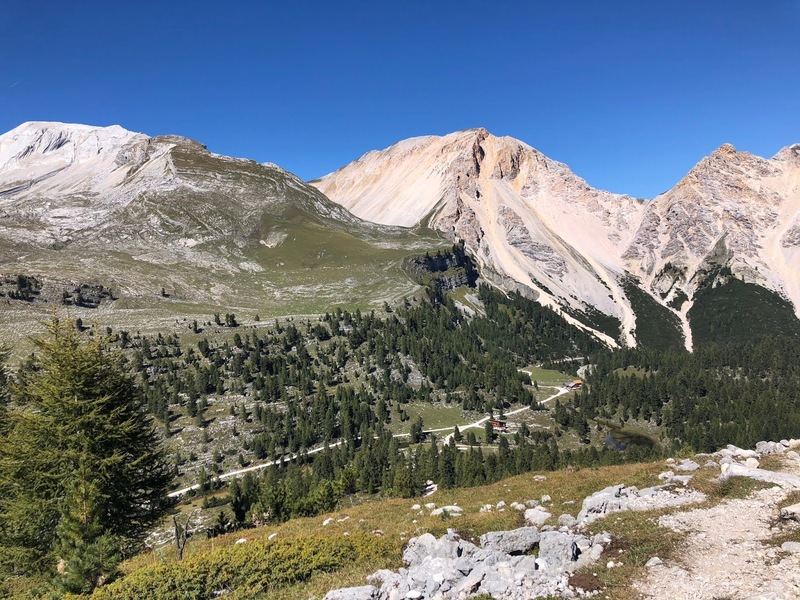 Today, Jimmy Hutte is bustling with people, some just come to dine and take in the incredible view while others fuel up and then take off on their way to Rifugio Puez, centered in the southern half of the Puez-Odle park. 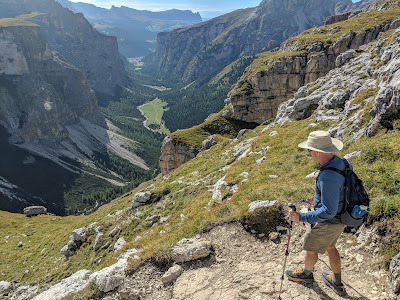 Following the Alta Badia app suggested route, after Lunch at Rifugio Puez, we retraced our steps for about 1 km and then found the trail heading for Colfosco. Our hike route looked like an upside-down letter Y.
Alta Badia app map and overview for Hike 1 - Puez. Duration: 5.5 hours official walking time by Alta Badia app; we took 9 hours including a mid-morning snack stop at Malga di Gran Fanes and then lunch at Rifugio Fanes. Elevation: Lowest point 1,542 m (5,059 ft) at Capanna Alpina, Highest 2,171 (7,123 ft) along the trail. When you ask for hiking advice, for example from your hotel, chances are this hike will be a recommendation, or more accurately, a visit to the Fanes-Sennes-Prags Nature Park where this hike is located. This park is due east of Hike 1: Puez-Odle. There are many ways to enjoy the natural beauty of the park. Out of stubbornness we decide to try the same route as 10 years ago, that is starting at Cappana Alpina, located in the southwest tip of the park. Stubbornness because 10 years ago in 2008 it was a cold and rainy day and we feel like we had some unfinished business here. By the end of this hike today, was had our second wow moment and we came away with a much different impression of this hike due to warm temperatures and sunny skies. For a highly recommended hike, we didn’t find the trail busy at all. It’s less famous that Hike 1 above or Hike 4 below. Left: Hike 2 - Trail # view south with Monte Castello on the left. Center: Hike 2 - View north toward Piz de Sant'Antone - Monte Sella di Fanes with Rifugio Fanes in the valley. Right: Hike 2 - View of the Sella Group from Col de Loćia. After parking (paid) at Capanna Alpina, you can stop for refreshment and a bathroom break and then be on your way. There is a little bit of an interpretation center just beyond Capanna Alpina that’s worth a brief stop. After that, it’s trail #11 for the next few hours. We stopped off at Malga di Gran Fanes mid-morning for coffee and a slice of apple cake. The next stop after that was Rifugio Fanes for lunch. To return, we followed trail #11 back to Capanna Alpina. 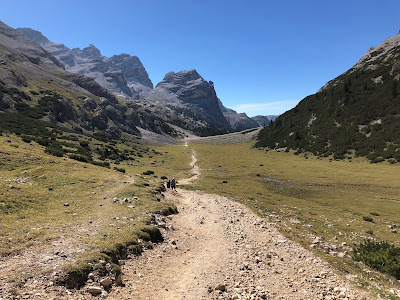 Most of the effort on this hike is coming up the 1700 feet from Capanna Alpina to a point that’s called Col de Loćia (2,069 m / 6,788 ft) where you start to get some great views. At Col de Loćia, don’t forget to turn around and look west toward the Sella Group and it’s highest peak Piz Boè. 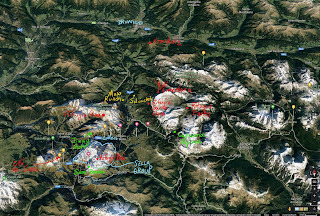 Alta Badia app map and overview for Hike 2 - Fanes. Duration: 3.5 hours official walking time by Alta Badia app; we took about 7 hours includings lunch at Ranch da Andre. Elevation: Minimal elevation gain and about 875 m (2,871 ft) elevation loss because we essentially walked down to the town of Badia. Rifugio Santa Croce (often referred to locally as La Crusc) is located at 2,045 m (6,709 ft). From Badia (in the valley at 1,315 m), we took the two chairlifts up to reach the rifugio where we started walking more or less north along the left side of the mountain group called East Dolomites of Badia. Monte Cavallo in the mountain that towers behind Rifugio Santa Croce. 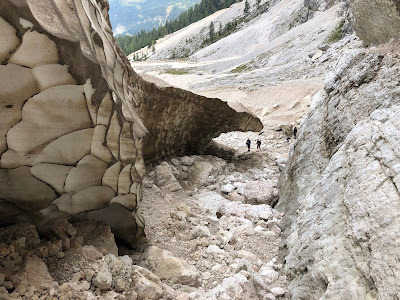 After heading out north from the rifugio, our first stop was a feature called Grotta del Ghiaccia, which is more a snow bank than grotto on this particular day in September. We climbed around and took pictures for about 30 minutes before moving on to reach Ranch da André for lunch. From he deck of da André there are great views of Sass de Putia, a mountain to the west. Top Row: Left and Center: Grotta della neve ("Snow Cave") Alta Badia. 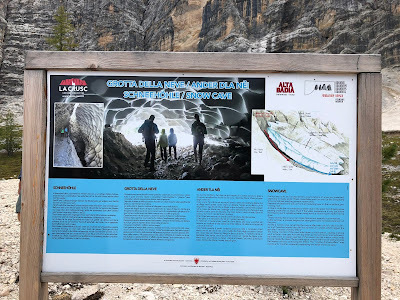 Right: Information on the Grotta della neve ("Snow Cave") Alta Badia. Bottom Row. Left: In the Prati d'Armentara and typical Tyrolean Barn. Center: Prati d'Armentara - heading toward Ranch da André. Right: Trail back down to Badia. After lunch we had intended to return to Rifugio Santa Croce and take the chairlift back down to Badia, but instead we decided to continue enjoying the Prati d’Armentara and walk back down through the pastures to Badia. The Prati d’Armentar (translated at the meadows or pastures of Armentara) is an iconic landscape of this part of Italy that you will not want to miss. The walking is easy, and the views are incredible. Ten years ago, we took the same chairlift to Rifugio Santa Croce but instead of heading north, we went south for a completely different experience. It was nice to be back in the area and experience the area in another way. Also, in 2008 we hiked around Sass de Putia. 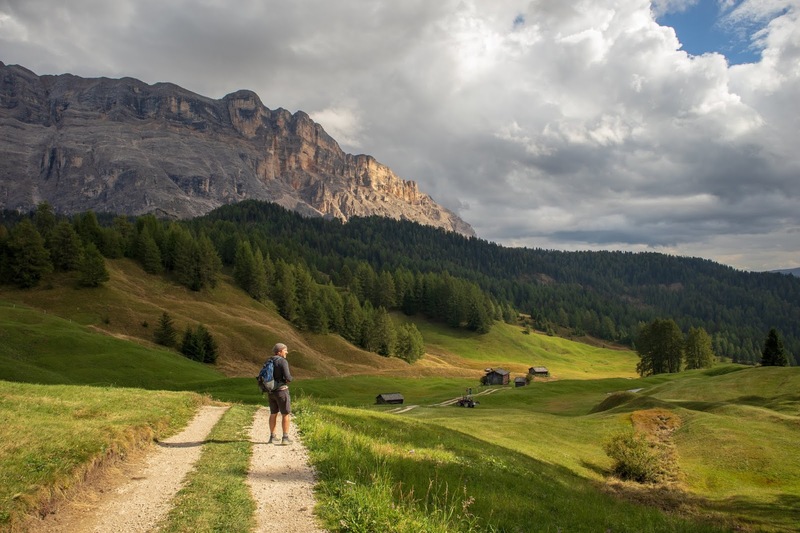 For more information, see the post Alta Badia and Val Gardena – Eight Hikes in the Dolomites. Alta Badia app map and overview for Hike 3 - Prati d'Armentara. 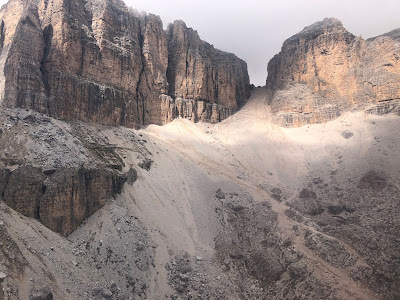 Sass Pordoi or Sasso Pordio is on the south side of the Sella Group or massif. (For reference, Colfosco – our home base – is on the north side.) Sasso means rock in Italian, and Sass Prodio is a huge rock spur in the Sella group that offers 360-degree views; Sass Pordio is called la terrazza delle Dolomiti – the balcony of the Dolomites. You can hike up from the pass, Passo Pordio, where there is a parking lot and the lower station of the cable car. We opted to take the cable car up. From the top station of the cable car, we hiked to Rifugio Boè and back. We stopped for lunch at Rifugio Forcella Pordoi, located, as the name implies (forcella means saddle), in low pass between Sass Pordoi and Rifugio Boè. 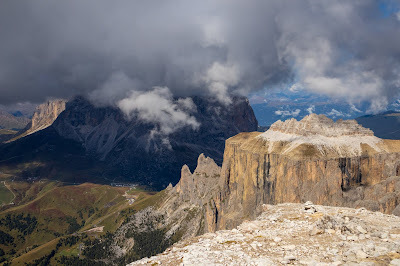 We did not summit the peak, Piz Boè, which is the main objective for many visiting the Sella Group. We saw a constant stream of people like tiny ants making their way up. It was a Sunday and a nice day, so it was busier than usual. 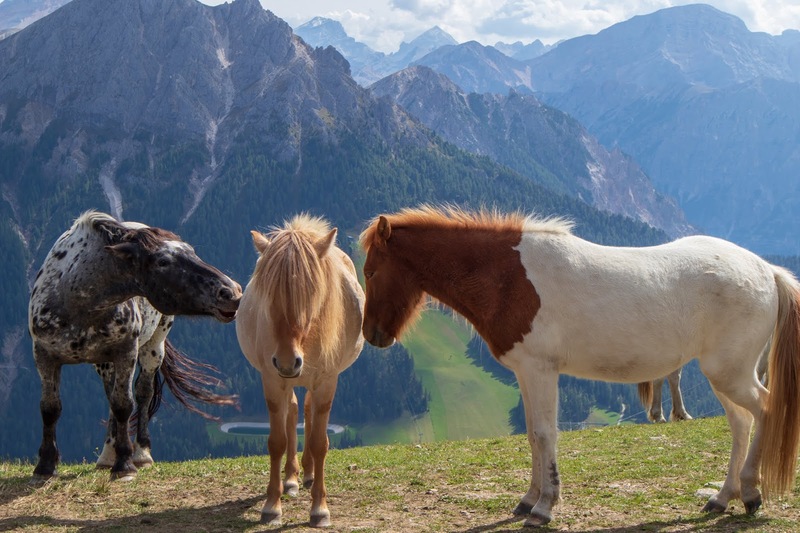 You do not have to summit Piz Boè at 3,152 m (10,341 ft) to enjoy the views or the interesting geography of the Sella Group. Rifugio Boè is not at the summit; it’s at the base of the rock formation called the “pyramid of the Piz” of which the top is Piz Boè. Top Row. Left: At Passo Pordio - Cable Car Base. Center: Trail to Forcella Pordoi if you want to walk up. Right: View from Sass Pordoi with part of Sella Group, Passo Sella, and Langkofel Group. Bottom Row. Left: Panorama from Sass Pordoi back down onto the Passo Pordoi. Right: Hiking near Città dei Sassi with Sella Towers in the distance. Elevation: At most 100 m gained and lost. We are calling this Hike 4.5 because after coming down from Sass Pordoi and heading back to Colfosco (clockwise around the Sella Group), we decided to stop off at Passo Sella and explore the feature called “La Città dei Sassi” or City of Rocks. 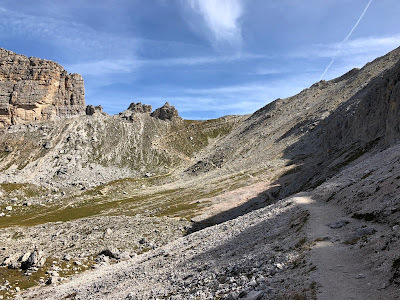 The easy trail from the parking at Passo Sella winds through trees and large boulder (the city buildings) that are fragments that rolled down from the adjacent Sassolungo Group. We took the lower trail walking north from the parking lot and then an upper trail back south to return. Besides the interesting rock formations, the views back on the Sella Group are beautiful, in particular the feature called the Sella Towers. 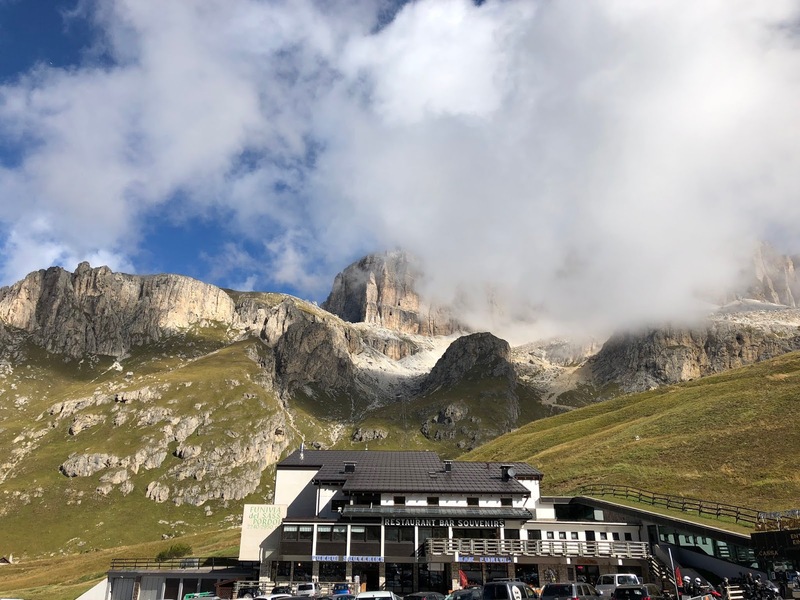 We cover eating in Alta Badia area in the post Dining Recommendations for Alta Badia in the Dolomites, South Tyrol. As for getting around, we rented a car. It would be difficult to do what we did on this trip without a car. We drove up from Bergamo, with a stop in Limone sul Garda to visit the Limonaia del Castèl and Torbole sul Garda for lunch at Ristorante La Terrazza. We went up the left side of Garda rather than taking the A22 , which would be faster, to specifically check out the limonaia in Limone sul Garda. Once upon a time the west side of Lago di Garda was an important site for lemon and citrus cultivation. The citrus production on Lago di Garda was the most northernmost cultivation. Citrus from Lago di Garda was destined for markets further north. The Garda citrus production collapsed in the second half of the 1800s due to disease and competition. Today, there are still ample reminders of this history in the numerous limonaie – think cement, wood, and glass greenhouses – that dot the west side of Garda. The limonaia in Limone sul Garda has been “restored” to some degree and can be visited. Aside: We had a friend who took the train from Milan to Bolzano and then a bus to Santa Cristina in Val Gardena. 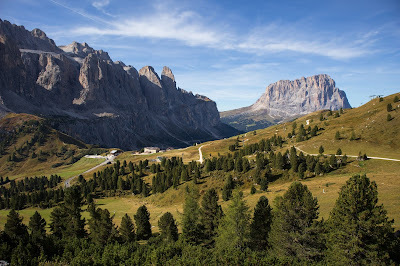 Val Gardena is the valley to the west of Colfosco where we stay. Our friend did her hiking based from Santa Cristina. So, while it is possible to reach into the Dolomites by a combination of train and bus as well, your options for reaching different trail heads are limited. In terms of driving, we structured our time so that Hike 1 (our day 1) was right from our hotel and required no driving since we had done a fair bit of driving the previous day to arrive. Then rest of the days, we were in the car for at least 30 - 60 minutes per day to reach our destinations. Much of our driving was going around the Sella Group or going up and down the Val Badia. Restaurant picks. The piece’s restaurant recommendation of the Michelin starred St. Hubertus wouldn’t be our recommendation for the first place to go to experience Ladino cuisine. We are pretty sure it’s good, but for a more authentic and less expensive experience try Maso Runch or Maso Sotciastel. For more info, see the post Dining Recommendations for Alta Badia in the Dolomites, South Tyrol. The one restaurant tip we did follow from the NYT times article was a stop at the restaurant/grocery story (Pur Süditrol) in Bruneck that proved to be a bit too precious for our taste. So much for tips. We would have done better eating at a Slow Food Osteria guide as we normally do, like Oberraut which was also suggested in the article to the author's credit. Routing. If you go through the piece's suggested routing, recommendation by recommendation (and we did), and look at it on a map, it doesn’t make a lot of sense. The route doubles back on itself at times and wastes a lot of extra time driving. Driving time. Our biggest concern about the itinerary are the distances covered in the 36-hour time-span of the piece. First, arrival to Dobiaco, where the 36 hours start, and departure from Ortisei, where the 36 hours finish, are completely left out. You must arrive and depart somehow. Second, while the distances and time in the car are feasible, they would be a lot in our opinion. The skipping around from one valley to the next isn’t that realistic. For fun, we assumed an arrival and departure from Verona (a reasonably large airport) and renting a car to reach Dobiaco and return from Ortisei. After factoring these assumptions in and calculating times, we came up with about 900 km (or 560 miles) of driving for a 3-night stay. That’s a bit much, especially in the winding roads in the areas explored. Using Google Maps driving time, we estimate over 16 hours driving, about 40% of the 36 hours. Yikes. On the subject of driving in Val Badia, we decided to spend one day off from hiking and based in the town of Brunico. Driving to Colfosco to Brunico, while not a lot at just under one hour, felt like a long time. 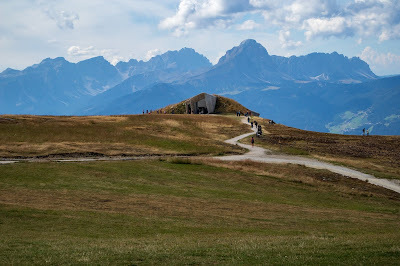 Just a few kilometers south of Brunico is where we picked up the Funivia Plan de Corones up to the MMM Corones – a Messner Mountain Museum. The museum was designed by Zaha Hadid, whose designs have cropped up on a number of recent journeys: once on the start of a hike in Innsbruck where Hadid designed the futuristic funicular stations (see Hike in Innsbruck: Hafelekarhaus to Pfeishütte) and once more recently on a walk in the NY High Line where we noticed her project 520w28, an apartment building. After kicking around Kronplatz for a bit, we went back down to Brunico, ate lunch, walked and shopped a bit. Then back to Colfosco. If you have read or skimmed this far, congratulations! One more section to go. Here are some terms that pop up a lot when talking about or planning a trip to this area, terms you should know before you go. 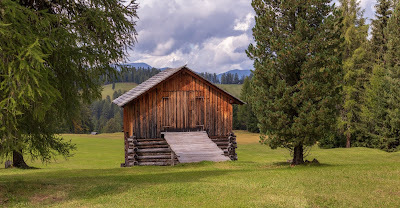 Trentino-Alto Adige/Südtirol is an autonomous region in Northern Italy made up of two provinces: the Province of Trento, commonly known as Trentino, and the Province of Bolzano, commonly known as South Tyrol. In English, the two provinces together are called either the region of Trentino-South Tyrol or by its Italian name Trentino-Alto Adige. Italy is made up of 20 regions, of which five are granted a broader amount of autonomy, like Trentino-Alto Adige. Autonomous regions have varying degrees of control over legislative, administrative, and financial matters compared to non-autonomous regions, which are more subject to the dictates of Rome. Historical reasons were behind the autonomous grants. South Tyrol is where the hikes described in the post take place. Left: Hike 3 - Prati d'Armentara, view toward Puez-Odle Massif. 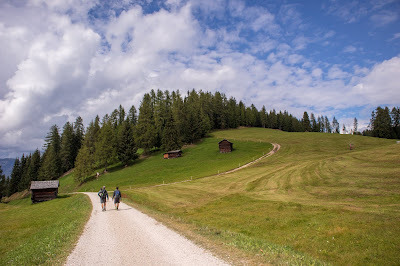 Right: Hike 3 - Walking in the meadows above Badia. The Dolomites Alps are a mountain range located in the provinces of South Tyrol and Trentino (making up the region of Trentino-Alto Adige) as well as the province of Belluno, which is part of the Veneto region. The Dolomites are part of the Eastern Alps. The French geologist Déodat de Dolomieu (1750 – 1801) described and collected samples of the rock we today called dolomite – named for Dolomieu. Dolomite is a mineral composed of calcium magnesium carbonate that is found in abundance in South Tyrol. Looking at any of the large pale ranges and massifs of the South Tyrol and you are looking at dolomite rock formed over 200 million years ago in shallow lagoons. You might be familiar with using dolomite lime in your yard to raise the pH of soil. The highest peak in the Dolomites is Marmolada at 3,343 m (10,968 ft), just south of Corvara and visible on Hike 1, 3, and 4. In all the Alps, Mont Blanc is highest peak in at 4,808.7 m (15,777 ft). Mont Blanc is on the border between Italy and France. Left: Hike 1- Looking southwest down Langental (Vallunga). Right: Hike 2 - Gragn Banc, Parco naturale Fanes-Sennes-Braies, trail 11. 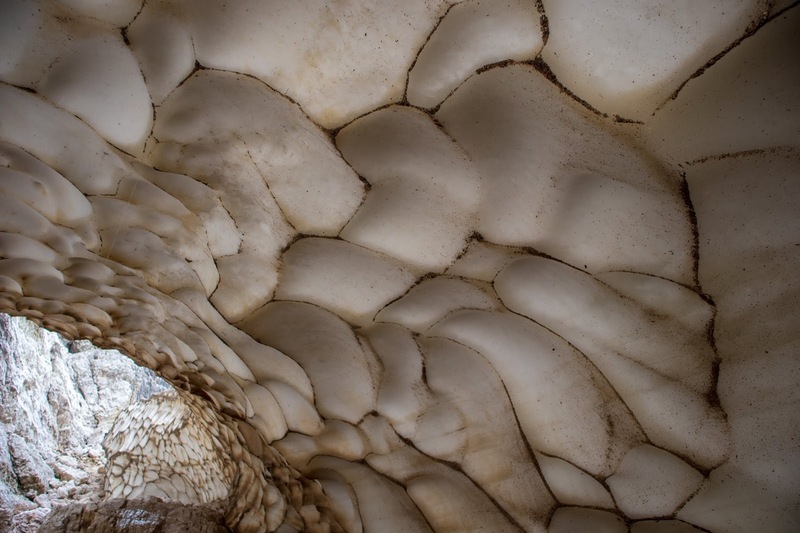 The UNESCO designation comprises nine mountainous systems. Hike 1 takes place in the UNESCO-designated system of Puez-Odle. 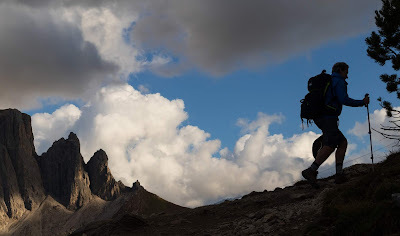 Hike 2 takes places in the system Dolomiti settentrionali. Hike 3 takes places along the western edge of the Dolomiti settentrionali. 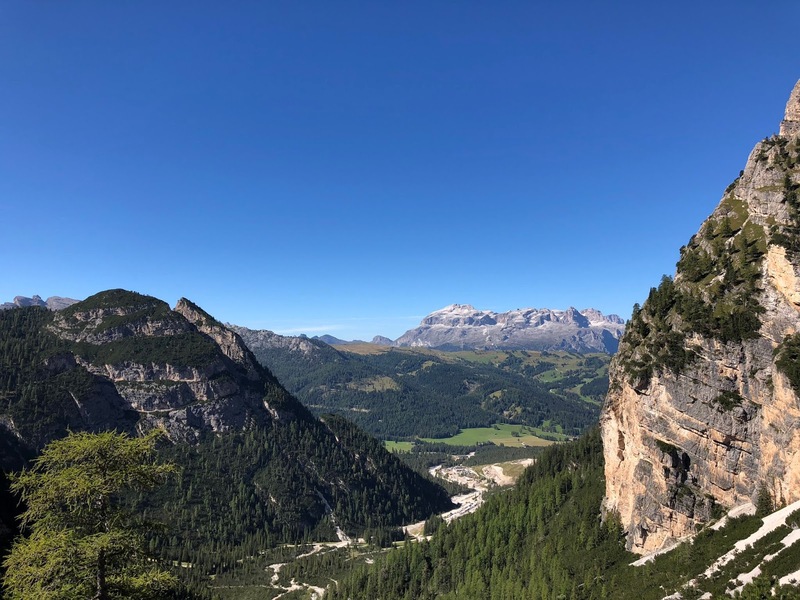 We were surprised to to find out is that the Sella Group and Langkofel Group – Hikes 4 and 4.5 – are not part of UNESCO-designated areas. 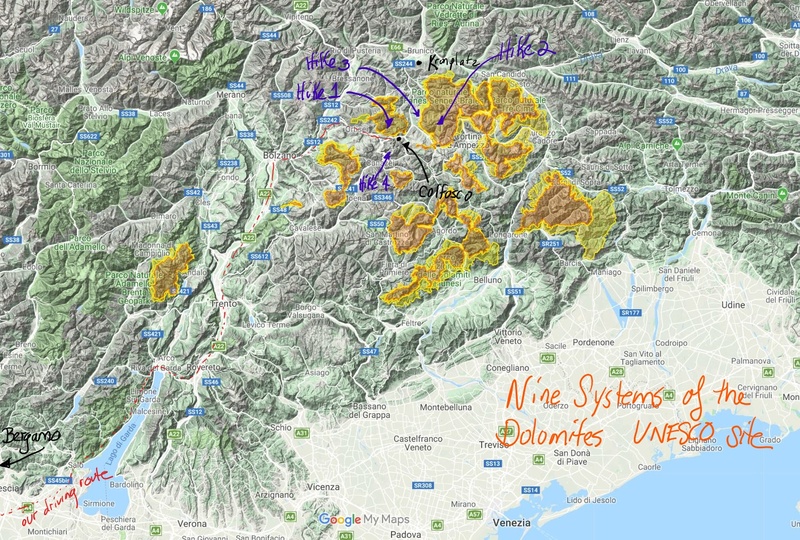 Left: UNESCO Nine Systems of the Dolomites. Center: Hike 3 - Badia town. Right: Badia ski-lift to Rifugio Santa Croce. So why do we keep talking about massifs? The term massif typically is “used to refer to a large mountain mass or compact group of connected mountains forming an independent portion of a range.” [Wikipedia] If you flooded the valleys and looked at the region from above, each massif would appear like an island. The massifs in the Dolomites are striking because of their light color – the Dolomites are sometime referred to as “the Pale Mountains” – and how, in the right conditions, the massifs can work the alpenglow effect at sunset. Left: Hike 4 - View from Sass Pordoi with part of Sella Group (in sun), Passo Sella, and Langkofel Group (in clouds). Right: Hike 1 - Last part of hike heading back to Nature Delta Hotel in Colfosco with Sella Group in background. Badia is the name of a town and Val Badia is the name of the valley where Badia is located. Hike 3 starts and ends in Badia. 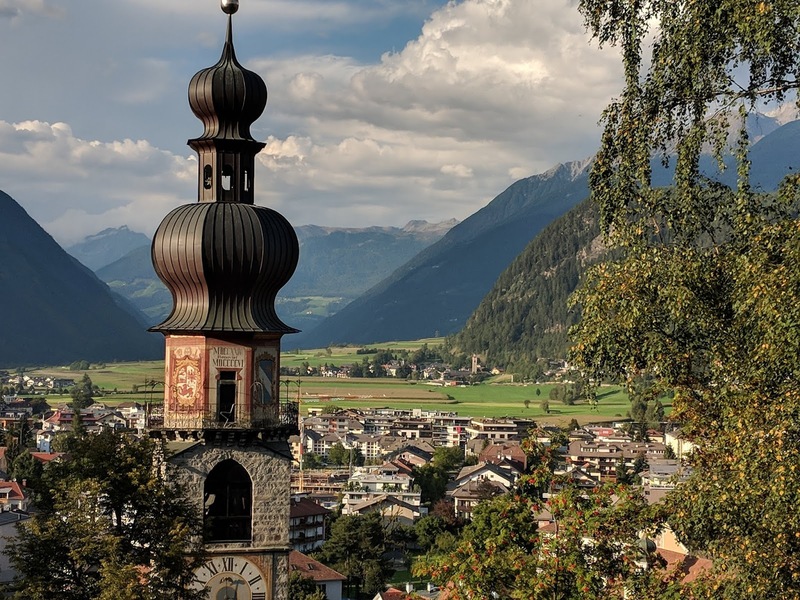 The name Badia seems to have come from the word abbey (abbazia in Italian minus the first two letters more or less) because back in the 1400s the area was connected to an abbey near Bruneck. 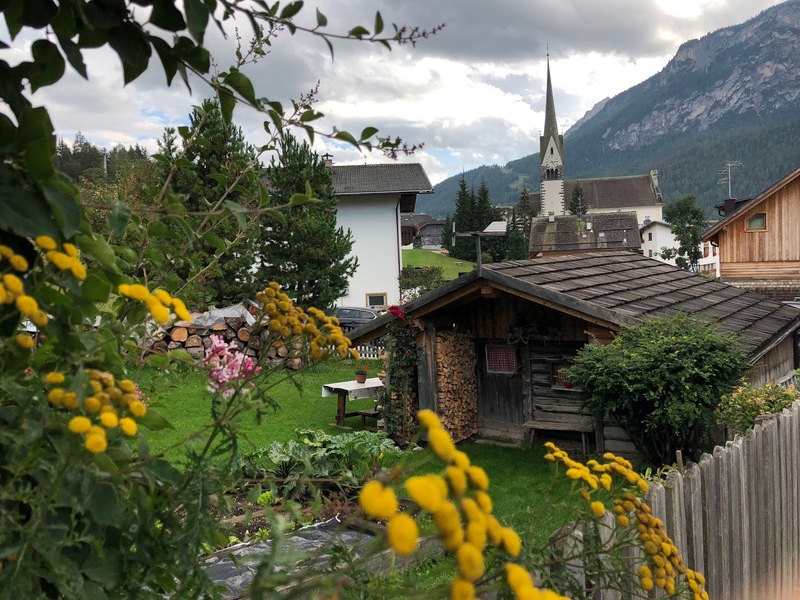 Val Badia is a place where the Ladin language is still spoken and used. 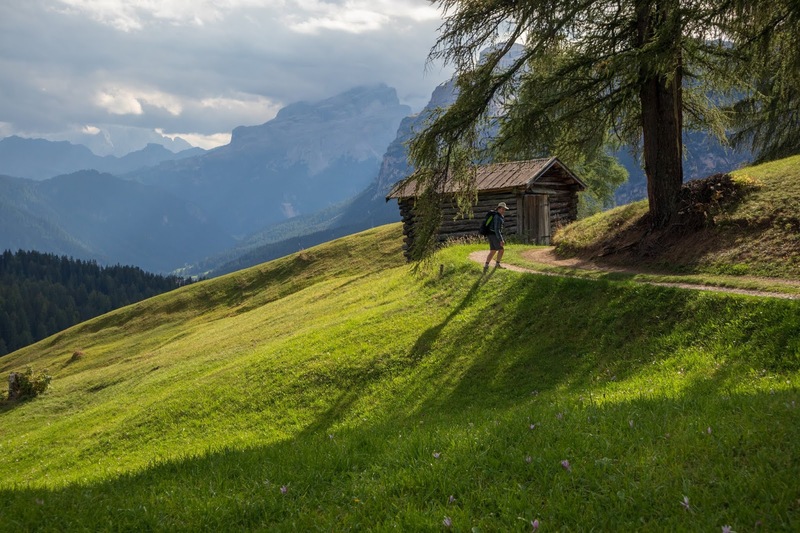 If you have the occasion to eavesdrop on conversations in the Val Badia, you will also hear a lot of German and a little Italian. 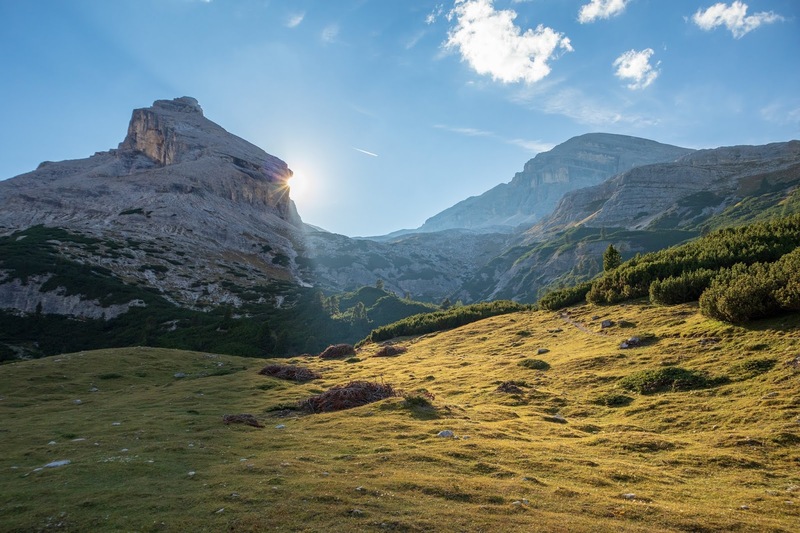 Val Badia is in the eastern part of of the province of Bolzano. Alta Val Badia Badia refers to the area between Corvara and Badia, and Bassa Val Badia refers to La Valle, San Martino, and Marebbe. 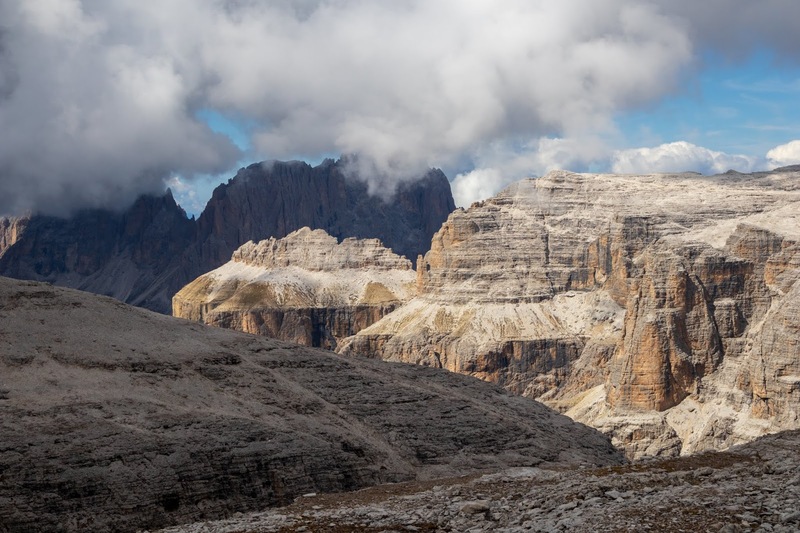 Note that Bassa Val Badia is north of Alta Bada and is called lower (bassa) because the area is generally at a lower altitude. We once saw somewhere that the name Colfosco roughly translates to dark or somber (fosco) hill (colle). Being on the north side of the Sella Group means that Colfosco gets dark quickly in the winter; think of the angle of the sun. I remember skiing one afternoon in early December from Passo Gardena back to Colfosco and while there was a blue sky overhead, the Sella Group cast a big shadow over the ski run. 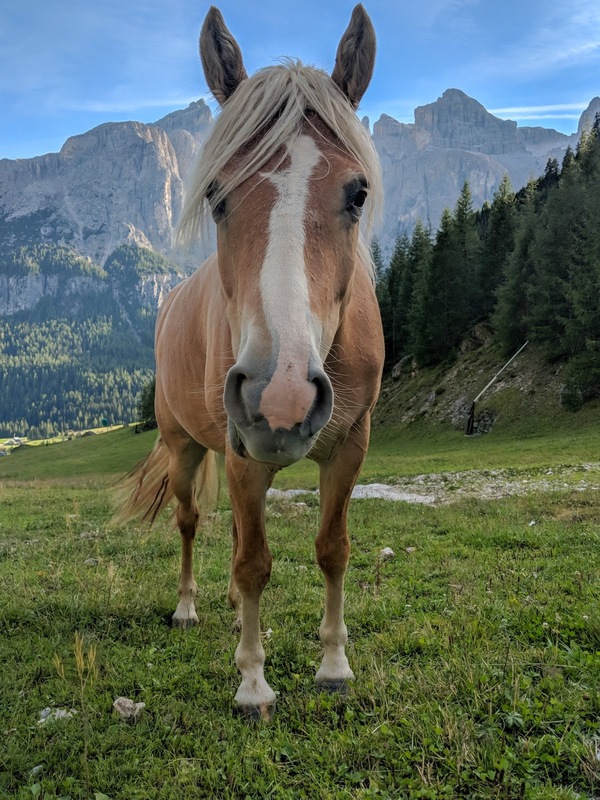 As you would expect, many of the accommodations, like Nature Hotel where we stay, are on the north side of the valley, situated high enough to avoid being in the shadow of the Sella Group. Corvara is the next town east of Colfosco. 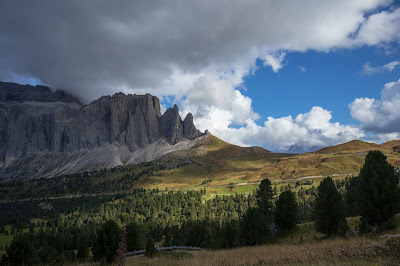 A little lower in the valley and standing clear of the Sella Group, Corvara doesn’t suffer the same dark shadow issues. Corvara derives its name from the Latin corvus (“crow”). Sooner or later, while staying visiting Val Badia, you will have to go through Corvara. The geography dictates limited routes for getting around these huge mountain massifs. All roads go through Corvara. The crows knew that. One of the most characteristic sights in Val Badia and elsewhere in the Dolomites are the beautiful farmhouses and their surrounding property, a combination of pastures and forest. The farms are referred to in this part of Italy as masi plural and maso singular. But besides the beauty of the individual or often groups of buildings, there is a certain rhythm in the landscape that is instantly pleasing. It's inhabited but not crowded. It appeals to our Utopian ideals – does anybody still have those? A maso chiuso is one unit, indivisible; it can’t be divided into parts. A maso chiuso must meet a certain annual income to support at least a family of four, but not exceed three times that income. A maso chiuso must follow precise rules for inheritance such that the farm is essentially never divided. We haven’t seen anybody linking the beauty of the area specifically to the concept of the maso chiuso, nor are we familiar with life under such a designation (is it a pain? ), but it sure seems to us that the aesthetic appeal of this area is a by-product of this medieval institution, that is, the spacing of the farms today is as it has been for quite some time and hasn't been given over to the kind of icky development of vacation homes and other housing sprawl. 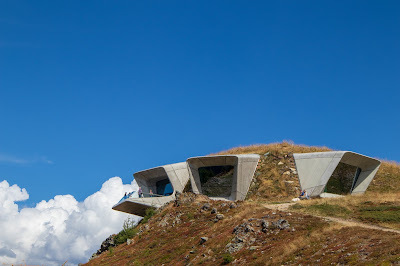 MMM stands for Messner Mountain Museum(s), a network of six museums in the Dolomites founded by Reinhold Messner, an Italian mountaineer and author from South Tyrol. The museum locations and designs are evocative, with each, dare we say sumptuous, museum dedicated to a theme connected to the mountains. For example, MMM Corones is dedicated to traditional mountaineering, celebrating not only Messner but other mountaineers as well, and mountaineering firsts. During this hiking trip, we took a break from the trails and spent one day centered around Bruneck. We were specifically interested in visiting MMM Corones – designed by Zaha Hadid – which sits on top of the rounded mountain called Kronplatz (Plan de Corones in Italian), just few kilometers south of Bruneck. We spent about and hour and half admiring the distinctive Hadid-designed museum inside and out, along with the mountaineer-themed exhibits. (Honestly, to see the work of Hadid was one of the main reasons why we came.) Later in the same day, we walked around MMM Ripa, which occupies Bruneck’s old castle. All MMM locations are in the Province of Bolzano. MMM Corones and MMM Ripa being so close is a two-for-one for the museum junkie and both can be easily visited in one day. To get to MMM Corones, take the Funivia Plan de Corones located in Riopratino about 3 kilometers south of Bruneck’s historic center. You could park in Bruneck see both museums and walk to the base of the funivia station. Left: View inside MMM Corones, Kronplatz. Right: View outside MMM Corones, a Zaha Hadid designed-structure.